This is a special review to Cyber News and Reviews of a touching children's educational show previously published in 1998 in print and then on the Internet. It's all about "The Big Comfy Couch," a gem of a program series kids ages 2 and up will love, and parents will love it with them. It's warm and moving, funny and sad, but always entertaining for any age, once a daily staple for my girls. It may still be aired on PBS in certain areas, but if you can't catch it, I suggest you go out and buy a tape or two. They're still available. 2012 Alyson Court update. If you're wondering what Alyson is doing these days, you can see for yourself. She's very active and vocal on Twitter (@acourtroom), and also a devoted mom to a handsome (and bright) young son she calls The Boy. If you read her tweets, you'll see she very outspoken on Canadian and US politics. Though blunt and to the point at times, you can see she's still the warm and vibrant person who posed for a photo with my girls many years ago. If you're wondering what Major Bedhead (Fred Stinston) is up to these days, he's also on Twitter (@FreddyWonder) sharing some fun facts, photos and videos with Alyson and his followers. Robert Mills (@RobboMills), the producer of The Big Comfy Couch (played Fuzzy and Wuzzy), is also there sharing his thoughts, and often with links to some of his current muppet projects (love his Ruffus the Dog videos with great music). If you ever watch an afternoon of public television and find an unusual program with clowns who guide kids (ages 2 to 8), through life's situations, you have reached the crossroads of Laurel and Hardy and into the surrealistic world of The Big Comfy Couch. It's a day in the life of the cute little girl clown, Loonette, and her rag doll Molly. You'll meet Major Bedhead (Fred Stinson), a wacky clown who delivers mail on a unicycle with a talent for dancing that's a cross between Michael Jackson and the comedian Jim Carrey. You'll find Granny Garbanzo (Grindl Kuchirka) offering grandmotherly help and advice with her noticeably Hungarian accent. And often, Auntie Macassar, the world traveler, will drop in unexpectedly to share her adventures with Loonette and the gang who live near Clowntown. The show begins with Loonette and Molly on a big green couch, reminiscent of Lily Tomlin's performance as Edith Ann, the 6-year-old, on a big rocking chair. Could Tomlin's Edith Ann have inspired Cheryl Wagner, the creator and producer of The Big Comfy Couch? It offers a window into the thoughts and feelings of a child, with real-life situations involving love, friendship, caring, joy, anger, sadness, grief and humor as well as learning. Puppets have an important role in the show, including Molly and those playful Dustbunnies, Fuzzy and Wuzzy, who live under the couch. Loonette denies that they exist, but Molly knows otherwise. After some fun with toys, a song, a story or pretending the couch is other than a couch (maybe a pirate ship or airplane) Loonette stretches on a clock rug for exercise. Then it's out to visit Granny and check for mail from Major Bedhead, who arrives on his unicycle (unless he's impersonating Elvis, in which case he may rumble in on a motorcycle). When the three are together, more fun begins, which may include singing and dancing or a visit from Auntie Macassar (who adds an exceptional voice with some catchy tunes), often visiting as they're reading her letter to Loonette. She's been known to parachute in, or even perform live right from within her note. Which brings me to the heart of the show, that has it stand out proudly on its own in this arena of educational programming. Although there are many examples of exceptional themes, I choose two that appeal to kids as well as adults in teaching what it means to be alive. The first show is themed The Longest Night, where the characters gather together at Granny's to celebrate the longest night of the year. They stay up all night and talk, share their inner thoughts, sing a memorable and melancholy tune expressing the night, the season and their love and friendship. Although disguised as a celebration of the season, I saw it as a melding of all faiths into one non-denominational holiday, and beautifully done. Not knowing that any other show could be more moving than The Longest Night, I watched in amazement when a show involving the death of the caterpillar was aired. I had never seen death expressed so clearly and with wonderful advice for both adults and kids until I experienced that program, and it was all in a song. Sometimes you have to say goodbye, I'm sorry. Cause, sometimes things just have to go, their own way. I have to say, if it starts it has to end, but you'll be happy again, in good time. As Granny sings the song, Loonette buries the caterpillar. At the end, Major Bedhead begins crying uncontrollably. Loonette has finally understood, and comforts Major Bedhead. I watched this program with my wife and kids and could hardly hold back the tears because we had lost loved ones, and the message was true and clear. I lost my mother seven years ago to heart failure and my wife lost a sister to lung cancer, and it was very hard to accept, but we survived, with memories. I applaud the creator and producers of this series. It rates above and beyond the best. Because of the quality and messages, we wanted our kids to meet Loonette when she was in town on a US and Canada tour last October and November. We waited in line for two hours at our local mall to have a minute and a photo with Loonette (Alyson Court) and Molly (as herself). As you can see, I found my way into the photograph with Sarah (who is 6 years old) and Becky (she's 3). * The line wrapped around the inside perimeter of the mall, the size of a football field. Our wait was short compared to those families at the end of the line who would wait at least three or more hours to talk to Loonette. 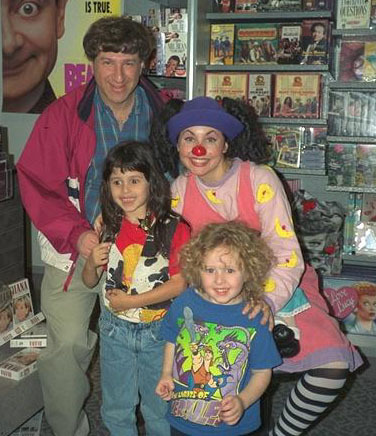 The Big Comfy Couch has been running at least four years, and the Alyson Court is a mere twenty-five. * She does a great job as Loonette, and is obviously well loved, and we agree. *Sarah is now 24 years old, Becky is 21.